At one point in their history, many countries, and most of Europe, were ruled by a king. With, as an accessory, a queen. But on at least three occasions, France has had what I like to call Double Queens. One woman was Queen of France twice. The other two, after reigning over France, became the queen of another country. I may have overlooked someone - and if so, I apologize - but let’s concentrate of these three venerable ladies: Eleanor of Aquitaine, Anne of Brittany and Mary Stuart. And let’s take them in chronological order. Before becoming a queen, Eleanor was Duchess of Aquitaine, which covered one-third of today’s France, from the Pyrenees to the Loire River and from the Atlantic to the Rhone. It was a rich region, so Eleanor was one of the wealthiest and most powerful women of the Middle Ages. In addition, her father’s court was a beacon for the arts, so she was highly educated, unlike most women of her time. And she was beautiful. An attractive marriage prospect on many levels. Her father died when she was 15, making Eleanor the most eligible heiress around. Within the year, she was married to Louis VII, who soon became king of France. Not one to sit around, Eleanor followed her husband to the Holy Land on the Second Crusade. Which didn’t go well, either for the Crusade or for their couple. In addition, Eleanor had borne Louis only two girls, and girls could not inherit the French crown, so when a divorce was suggested, it was agreed to. 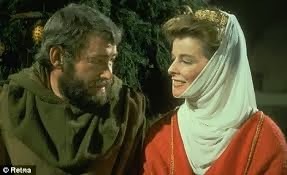 And Eleanor even got her dowry (Aquitaine) back as part of the deal, making her both eligible again and still attractive. Some say the reason Eleanor agreed to the divorce was to marry someone she was already having an affair with: Count Henry of Anjou, who two years later became Henry II, King of England. Eleanor’s ex, Louis, lived to regret his decision even though his third wife finally bore him a male heir. Not only did he lose the vast, rich lands of Aquitaine to France’s “hereditary enemy” England, but Eleanor bore Henry three daughters... and five sons, making any chance of France inheriting the English crown just a fading dream. Still all was not well in England. * After twenty years of married life, Eleanor, along with two of her sons, plotted against her husband. The plot failed and Henry had her imprisoned until his death 16 years later, when son Richard let her out. Ever the political person, and despite her advanced age for the time (she was in her 60s), Eleanor acted as regent while her son King Richard was away on the Third Crusade, and also helped negotiate his release when he was taken prisoner in Germany on his way home. Her role in English politics ended when John took the throne in 1199. She returned to Aquitaine where she spent her final years as a nun, but still involved in the affairs of her homeland. 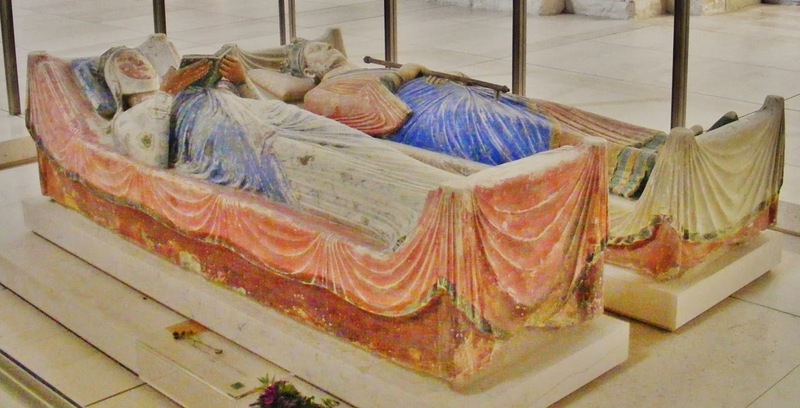 Queen of England or not, Eleanor is buried in Fontevraud Abbey near Chinon, France, next to husband Henry and son Richard, who may have been Kings of England but were still just Plantagenêts from the Loire Valley at heart. It’s Sunday, and the sun is out and the wind isn’t, both of which are a welcome change. There’s an opportunity here that needs to be seized. So it’s carpe diem for me. Now Me has seen a lot of Impressionist exhibits. They usually include works on loan from other museums around the globe. But this show is different. These canvases come from private collections and may never have been in the same city or even the same country before, let alone the same room! That room needs to include me. So out comes the Métro pass - three different Métro lines, two changes, a bit under one hour - and I’m off. Going to this small museum while others are enjoying Sunday dinner is a good idea. And yet the guard still lets us in only in clusters so people will have room to enjoy the artwork. At least the line is indoors. As I wait near the head of it, my eyes are drawn to the very first painting, Voilier dans le port de Honfleur by Jongkind. It will end up being my favorite, maybe because of the time I got to spend with it but also because of Jongkind’s mastery of light on water, which to my mind is one of the hardest things to get right in all of art. He also got the luminosity of the sky right. Not to mention all those different shades of blue, even reflected in the sails, so I’ll be awarding him both ears and the tail. As this museum was once a mansion, the art is hung throughout a series of rooms. That’s very fitting because every one of the hundred-odd masterpieces - canvases, drawings, sculptures - came from private homes. Fifty homes, to be exact, located around the world - in France, Switzerland, Italy, Great Britain, Mexico and the United States. This show is intended to trace the evolution of Impressionism through works that haven’t been seen often, if at all. And the show’s cast of artists is absolutely mind-boggling: Corot, Boudin, Jongkind, Manet, Bazille, Monet, Renoir, Degas, Pissarro, Sisley, Caillebotte, Morisot, Guillaumin, Cézanne, Rodin, and even an American, Mary Cassatt, plus an Impressionist I haven’t heard of before, Eva Gonzalès. Three women in all. Not such a bad score for those stodgy old days. The exhibit is chronological rather than organized by artist, although there’s some of that as well because of the dates. The first room, the one with the Jongkind I enjoyed so much, focuses on what it calls the roots of Impressionism. 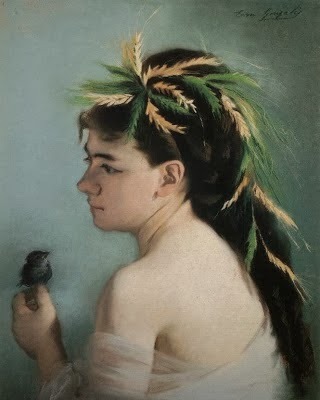 The newborn style can be seen in a few Corots, who was one of the precursors of Impressionism, as well as a Manet - The Bar at the Folies-Bergères. And there are several works by Boudin, who inspired Monet so deeply. Boudin concentrated his artistic skills on maritime scenes, and they range from an overcast view of The Port of Bordeaux - all in greys and browns - to the sunny pastel blues of The Beach at Bénerville. There are also aquarelles of Three Breton Washerwomen, in various tones of grey, and of people on The Beach in Trouville, which looks like a draft for an oil I saw in another exhibit last year. In fact there are several paintings that look familiar because artists often do several takes of the same subject, like Monet’s seafront in Normandy, a relative of which is hanging at the Musée d’Orsay. As you walk through the rooms, Impressionism spreads its wings from these beginnings. That’s especially clear with Cézanne’s works that morph from his low-key Geraniums in 1873 to his then-scandalous men stripping down for a skinny-dip in 1897. All styles of Impressionism are covered here, all the way to Sisley, so there’s something for everyone. Among all of it, two things stand out for me. The first is Monet’s drawings. That’s what brought him to Boudin’s attention, especially as they were done when he was only 17. Half of them are just penciled sketches - many of women in traditional Norman dress - and the other half are caricatures. Those are the ones I like the most. They remind me of the political caricatures at the Musée d’Orsay done by Daumier. The other wonderful reward is the number of works by one of my all-time favorites, Gustave Caillebotte. At age 34, he gave up showing his artwork and concentrated on his garden and on building and racing sailboats, a fact I serendipidously learned on last week’s trip to visit my naval architect friend in southwest France. Most Caillebotte paintings that I’ve seen elsewhere were street scenes of Paris. It’s fascinating here to see him painting flowers instead - one of sunflowers (precursor of van Gogh?) 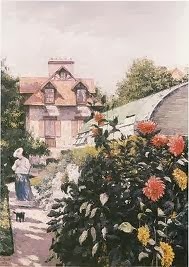 and one of dahlias in a suburban garden, complete with a woman and her little dog, too, off there in the background... all dappled in shadows, as Monet after him would do. The Marmottan’s write-up of the exhibit says there are about a dozen works by most every artist bridging his or her entire career. It also says the museum saved the best for last. 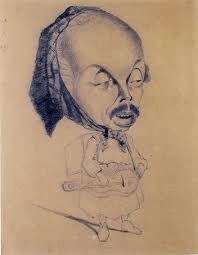 But as I don’t enjoy Renoir very much, in spite of the fact that he once lived in the house at my corner in Montmartre, his paintings don’t “talk” to me. Something about his excessive use of rosy pinks. It’s interesting though to see them because they include a portrait of Renoir’s wife that has never been on exhibit before anywhere. That alone makes it special. Oh, and there are two sculptures also. One of them - Degas’ Little Dancer - I thought was on loan from the Musée d’Orsay, but this must be her twin sister: same hands behind her back, toes out, eyes slit, chin jutting, little pointed nose in the air, all made more real by her tutu of tulle and an actual pink ribbon holding her bronze hair back. The other sculpture is one of many terra cotta studies Rodin must have made of The Thinker before he cast the ones in bronze that sit outside both Rodin Museums, one in Paris and its brother in Philadelphia. How amazing to see all these masterpieces gathered together in one place! There are stories here, I’m sure, tales of people who saw these canvases and just had to have them, recognizing this new way of painting for what it was: a personal view of the world, a view that spoke to them. Aside from this ground floor exhibit, there are plenty of other things to see at the Marmottan. Downstairs is their permanent collection of Impressionists (mainly Monet), except for the Berthe Morisots which are upstairs. Also upstairs is the museum’s huge collection of enluminures. Those enamored of Napoleon Bonaparte will enjoy the collection of art and furniture from the First Empire. Something for everyone at this Little Museum That Could. Yes, it’s off the beaten track. But well worth the trip. Whatever the reason, I’m ready to be made a fool if it means it’s no longer March. March came in like a lion and is leaving like a lamb (lamb for Easter, yum! ), along with the snow, which is slowly melting. We’ll all be glad to see the behind of it. We’re ready for April, in spite of the rains it usually brings: April showers, / bring May flowers / and kids cooped up in the house for hours! In honor of April Fool’s Day and its legendary poisson d’avril, as well as because it’s still Lent for the Christians among us, here’s a recipe I stole from chef Philippe DaSilva (and yes, that was once a Portuguese name but he really is French): rougets à la crème d’olives - red mullet with olive cream. It should please the fish lovers among you, is fairly easy and quick to cook, and requires few ingredients. You can substitute any mild-tasting fish - perch, tilapia, flounder, orange roughy - for the red mullet; it’s a common fish in the Mediterranean, but not equally elsewhere. Get the fish monger to fillet it for you, or you can even use frozen, provided you dry it well before cooking. Other substitutes: You can use oregano instead of marjoram if it’s more handy; after all, they’re related. (I had to use thyme for the photo.) If you don’t want to remove the stems from the spinach, buy baby spinach. And if you really can’t abide spinach, try some thinly sliced zucchini instead. The garlic-on-a-fork trick is good for those who enjoy the flavor but don’t want to actually eat it. So happy April, happy Easter, and happy no more snow. - Heat the cream without letting it come to a boil. Add the olives and continue warming for 2-3 minutes. - Put the cream, olives and 2T of olive oil in a blender/food processor. Blend well. Add salt and pepper to taste, remembering that the olives may already be salty. Keep this cream warm (for instance in a double-boiler). - After drying the spinach (a salad spinner works well here), heat the leaves in some olive oil. Spear a clove of garlic on a fork and stir the spinach as it cooks. When all the spinach leaves have wilted, strain them. - Salt and pepper the mullet fillets. Sauté them in some olive oil, skin side first. (That prevents them from curling up.) When they’re crisp, flip them over gently and put a few leaves of marjoram on top. When the second side is crisp, flip it over once more for just about half a minute. - Spread the spinach out on a serving platter, leaving some space at the edges for the cream. Place the fillets on top. Pour the olive cream around the edges and serve immediately. Accompany with a light, crisp white or rosé wine.